Ganesh Yantra for Good Luck and Success in Life . Lord Ganesha, the benement and God of wisdom & remove all obstacles. Ganesh puja is must before starting any work. It is most asupicious and is always invoked before any important work is undertaken be it the starting of a business, the building of a house of a house or the writing of a book or even undertaking a jounery. In Hindu mythology Shri Ganesha is revered as the son of the Shiva and Parvati, and is always honoured first in most worship services and rituals. 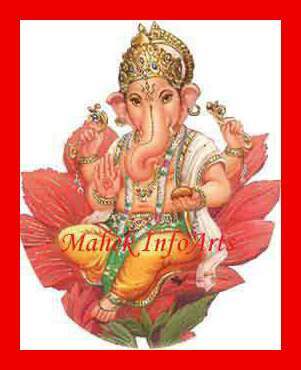 He is also known as Ganapati, Vigneswara (one who destroys hurdles), Vinayaka, Gajamukha and Ainkaran. He is worshipped for siddhi, success in undertakings, and buddhi, intelligence. He is also the God of education, knowledge wisdom, literature, fine arts, the design God of wisdom who removes all obstacles. Ganapati , the Lord of Ganas, the elephant faced God, represents the power of the Supreme Being that removes obstacles and ensures success in human endeavors. 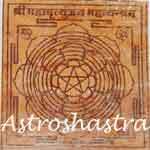 The one who do upasane & puja of this Yantra is blessed with success in his work, business, undertaking & desires. It is written in accordance to canons in auspicious lagna & mahurta and mantras be recited and is purified. This is composed of six triangles, closed on all the sides with a central triangle and binds inside. The Beej word (Gang) is recited for purifying it. Guru Adi Shankaracharya has recommended that every home shall establish it on its outer door or wall to get protection from all evils. 1. It removes all obstacles of Life. 2. Daily puja of this yantra blessed the sadhak with Peace of mind and happiness. 3. It give intelligence and success to its devotees. 4. Bless with healthy, disease-free life . 5. Pacify Rahu in Horoscope.